Lance Corporal Shannon Hoffman accepts the Law Enforcement Network Awards on behalf of the Hartsville Police Department. The Hartsville Police Department is hard at work to keep drunk drivers off of the streets of Hartsville. 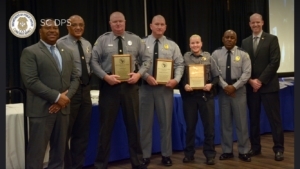 Their success has recently been recognized by the South Carolina Law Enforcement Network. On March 27, 2019 the South Carolina Law Enforcement Network awarded the Hartsville Police Department a Gold Level Award for being an agency that achieved 100% of its requirements for the South Carolina Law Enforcement Network’s Target Zero Challenge. The Law Enforcement Network also awarded DUI Officer, Lance Corporal Reichard, with both 2018 Officer of the Year and the Gold Level DUI Hero Pin for his efforts on combatting drunk drivers in Hartsville. In 2018, Reichard made over 50 DUI arrests. Efforts will continue to get drunk drivers off of the streets in 2019 as the Hartsville Police Department has hired a new DUI officer, Lance Corporal Brandon Pate. So far this year, Pate has made 4 DUI arrests and his efforts will continue throughout the busy spring and summer months. The Hartsville Police Department and Lance Corporal Pate will be conducting traffic checkpoints around the City in the coming days and weeks. These checkpoints help officers keep the streets of Hartsville safer by identifying drunk drivers before they can cause deadly accidents. Lance Corporal Pate has also been conducting numerous presentations around the City about the consequences of a DUI arrest. Being out and educating citizens about drunk driving has given Pate the opportunity to be proactive and discourage drunk drivers.